3Gstore.com Blog: Millenicom 20GB 3G/4G No-Contract Plan for $89.99/mo Available at 3Gstore - Use Any Compatible Device! 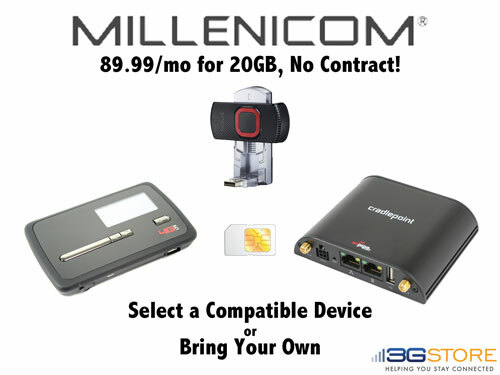 Millenicom 20GB 3G/4G No-Contract Plan for $89.99/mo Available at 3Gstore - Use Any Compatible Device! 3Gstore has partnered with Millenicom to offer 20GB of nationwide 3G and 4G LTE mobile broadband service for just $89.99/month plus a one-time activation fee of $50, with NO contract, credit check, or cancellation fees! We offer a variety of USB modems, hotspots, and embedded routers that can be used with the service, or you can "BYOD" (bring your own device) if you already own a compatible device! What are the costs? The one-time activation fee is $50, and you must also have a compatible device. We sell a wide variety of compatible USB modems, hotspots, and embedded routers (cost varies), OR you can "BYOD" (bring your own device) for a $25 fee. The 20GB monthly 3G/4G service costs $89.99/mo and is billed by Millenicom. No other fees apply, and you can cancel anytime! How and when is the $89.99/mo billed? Millenicom will bill you $89.99/mo on the first of every month for the 20GB service plan (your first month of service will be prorated). Is the service unlimited? NO. The $89.99/mo service includes a 20GB data allowance. If you repeatedly exceed 20GB, Millenicom may suspend or terminate your service. The Millenicom $89.99/mo 3G/4G service plan is available now at 3Gstore!